The first is the traditional Khatamband wooden ceiling which is made of small geometric pieces of Walnut or Deodar wood as seen in the pic below. This originated in Persia and made it down to Kashmir. These are traditionally made without any nails or glue and are just fitted together using joints in wood. These intricate pieces of art serve as a heat insulator as well. However it is a time taking task and expensive as such. Also with wood getting expensive this art form is slowly disappearing from Kashmiri homes. We are still lucky to have this ceiling in some parts of the house which was done more than 40 years ago and it even survived the floods. The second which most of you must be familiar with is the Bukhari, which as the name suggests came from Bukhara in Central Asia. Traditionally we had three kinds of Bukharis: Wood burning, such was the original type, then the Coal burning and finally the Saw Dust burning. The Coal one was the hottest but it came with the danger of asphyxiation. The Wood one was the second hottest but it need a constant supply of wood but never the less was the most popular one. In our house we had the Saw Dust one as it was most convenient though heat generation was less compared to the other two. However Saw Dust as a waste product was easily available in those times. Nowadays these are being replaced by Gas, Kerosene and Electrical heaters. And slowly the Bukhari would only be found at places like this. The Bukharis in the pic below are the extra large variety types and wood burning. 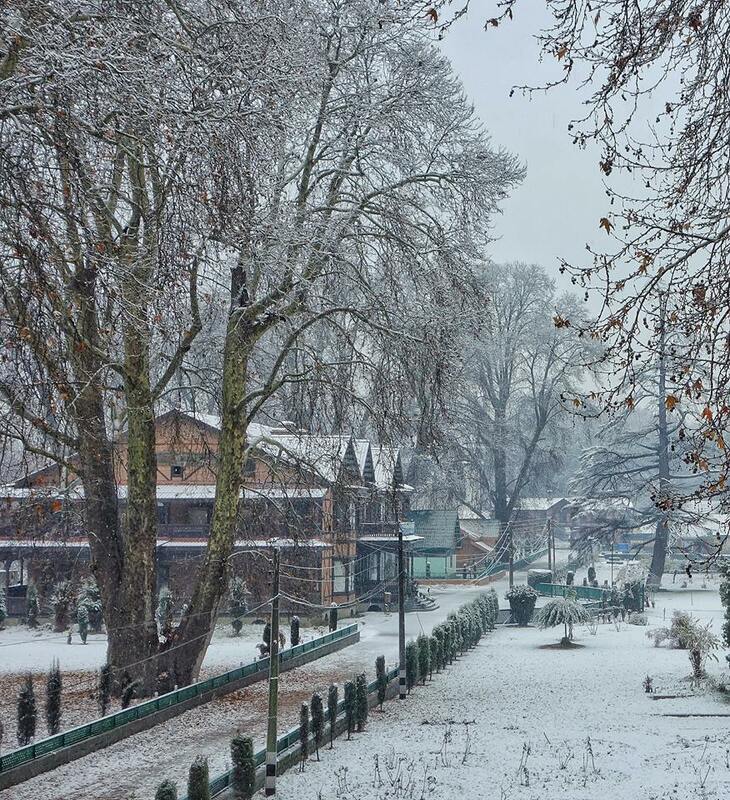 The Residency, which lends its name to Srinagar's stylish (once upon a time) Residency Road, after the light snowfall day before yesterday. This served as the Residence of the Resident of the British Indian Government to the Court of the Maharaja of Jammu and Kashmir. Set amidst vast lawns and surrounded by numerous Chinars hundreds of years old it sits right opposite to what used to be the Polo Ground. The building now serves as a Handicrafts Emporium showcasing arts and crafts from the Valley. Unlike other Hill Stations which were a part of the British dominion, Kashmir wasn't and the Maharaja explicitly forbade any foreigner from owning any land in the Valley (it still holds true in another manifestation which is now a Political issue). So all the British used to stay in Houseboats as they were allowed to stay on these and even own them. The Residency building is a beautiful heritage building with two magnificent gates on either side. One gate led towards the Lal Chowk area while the other opened towards the exclusive, white only, Srinagar Club.